of compelling characters who hold everything together. In the early 2010s, there wasn’t a bakery in Indianapolis that made hearth-baked, European -style bread. Lifelong Indianapolis advocate Tom Battista set out to change that. He found the ideal space—a 1924 factory warehouse in an historic Italian neighborhood in Downtown Indianapolis—and with the help of his nephew, Charlie McIntosh, started production in Amelia’s Bakery. The space Amelia’s occupied was big—big enough, in fact, to house more than just a bakery. So Tom brought in his son, Edward Battista, and Chef Abbi Merriss, and together they dreamed up a restaurant that would take the same artisanal approach to food that Amelia’s did to bread. They called it Bluebeard, after a book by Indianapolis native Kurt Vonnegut. the steady hand of Chef Abbi Merriss (who has earned multiple Beard nominations herself) it has continued to earn accolades and an audience of adventurous eaters from all over the world. Don’t take our word for it, though. Come see—and taste—for yourself. She makes the culinary magic happen. Since Bluebeard launched in 2012, Abbi Merriss has quietly ascended the list of the best chefs in the Midwest. A James Beard Foundation-nominated chef for four consecutive years (2016-19), Abbi’s genius lay in her ability to find that elusive sweet spot where sophistication and simplicity overlap. She blends the familiar with the unexpected, the classical with the unorthodox, the comforting mainstays of the Midwest with exotic and eclectic international flavors. Under Abbi’s leadership, the Bluebeard kitchen has become a sort of training grounds for up-and-coming chefs. She embraces the opportunity to mentor young chefs, even when it means eventually seeing them set off on their own adventures. That spirit of generosity extends to her food, where every bite feels like an unexpected, wondrous gift. While much of the rest of Indianapolis has been transformed by urban revitalization, Holy Rosary is anchored by people whose families have called its narrow, trees-lined streets home for generations. Here, “historic” isn’t just a word to describe the architecture. It’s part of the residential DNA. When you’re here, time seems to slow down just a little bit. While the city of Indianapolis continues to evolve with unchecked alacrity (and for the most part, we welcome the progress), Holy Rosary remains moored in tradition. And it’s a tradition we respect and honor—and which informs how we approach food and hospitality. Amelia’s is a production bakery in the Italian tradition. 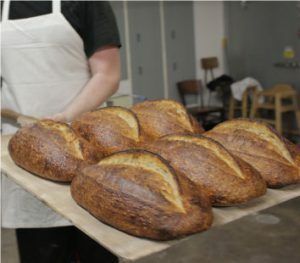 Every morning at 4 a.m., our bakers, mixers, and shapers get busy preparing hundreds of fresh loaves. And that’s to say nothing of the cookies, pastries, and other treats that are made in our production facility daily. Our hearth-baked sourdough bread is fermented for a longer period of time and at cooler temperatures than commercially yeasted bread, yielding deeper flavor and superior texture. Residents travel from all over Indiana to buy our bread and baked goods. And restaurants all over Indianapolis serve it. We’d love to see you in our Holy Rosary storefront today. Learn more at the Amelia’s website.